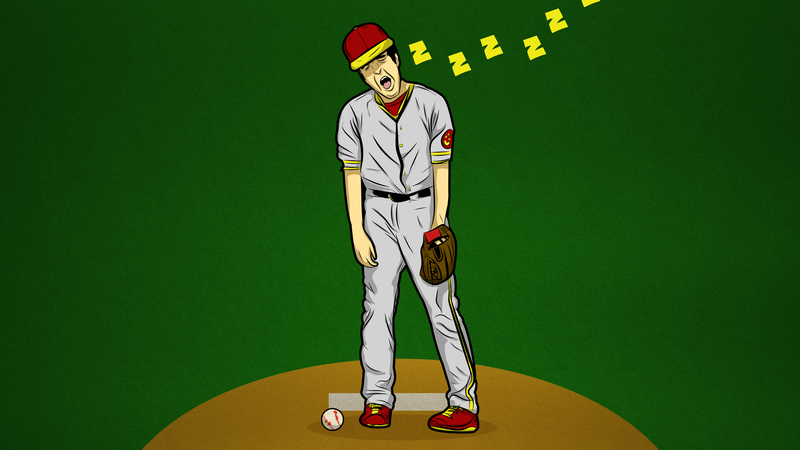 For the hundreds of Major League Baseball players, jet lag is an inescapable part of the sport. New research shows how disruptions to an athlete’s sleep cycle impairs his performance on the field—and how teams who have to travel east can be at a distinct disadvantage. A study published today in the Proceedings of the National Academy of Sciences has uncovered some interesting links between travel-induced circadian misalignment—what you and I call jet lag— and the performance of Major League Baseball teams. By analyzing nearly 5,000 baseball games in which players were jet lagged, Northwestern University sleep scientist Ravi Allada and his colleagues found that teams do worse when they travel east compared with when they travel west. The reason, the researchers say, has to do with our 24-hour circadian rhythm, and the difficulties of adjusting to a shortened day. The effects of jet lag have been studied extensively in controlled laboratory settings, but aside from anecdotal accounts and personal experience, less is known about impacts in the real world. Baseball, with its meticulous attention to statistics, provides a fantastic opportunity for scientists to study the effects of jet lag on specific aspects of human performance. In Major League Baseball, players frequently traverse long distances along the east/west axis, having to re-adjust their internal clocks by as much as three hours. For the study, Allada looked at 46,535 MLB games played between 1992 and 2011, finding 4,919 instances of teams playing with at least two hours of jet lag. Any team that traveled across two time zones (e.g. Los Angeles to Chicago) was considered jet-lagged. The researchers also allowed a re-adjustment, or resynchronizing, rate of one time zone per day. So, if a team traveled from Los Angeles to New York City (cities separated by three time zones), players would still be considered jet lagged on the first and second day after travel. With these criteria in mind, both home and away teams could qualify as being jet lagged (in MLB, teams spend anywhere from three to four days in a host city). The researchers then set to the task of analyzing these games, looking at team winning percentages, and individual player statistics, both offensive and defensive. The researchers were careful to account for potential differences in home and away performance (home teams tend to do better than visiting teams), and variables like park effects (e.g. some parks are more conducive to home runs than others). Looking at the data, Allada’s group found that the winning percentages of MLB teams suffered when athletes have to travel eastwards, but that effects were very limited following westward travel. In addition to losing more frequently, eastward-traveling teams also surrendered more runs. Runs scored, batting average, on-base percentage, and team slugging percentage (loosely defined at total bases per team at bat) dropped for home teams who returned east from a western road trip, but the same decline was not observed on the road west. Surprisingly, no significant correlation was observed between jet lag and offensive stats for visiting teams (more on this weird observation in just a bit). The most striking effect of jet lag was on poor defensive performance, exemplified best by home runs allowed by pitchers. An increased tendency to give up the long ball was seen among eastward travelers (but not westward travelers), and in both home and away groups. This single stat was enough to explain most of the jet lag effects observed in this study, and it was considered strong enough to negate home field advantage (call it “jet lag disadvantage”). In terms of actual numbers, jet lag-induced home runs resulted in increases between 0.1 and 0.2 runs per game. It may not sound like much, but in a 162 game schedule in which teams score anywhere between 700 to 800 total runs, that can made a big difference. The increases in home runs per game (0.107 for home teams and 0.073 for away teams) accounted for the majority (87 percent and 72 percent) of the extra runs allowed. That’s quite revealing. As noted, our circadian period is slightly longer than 24 hours, making it more difficult to adjust to eastward travel, which causes us to lose hours. “When you travel west you adjust by waking up later and going to bed earlier in relation to your home city time and your internal biological clock,” Allada told Gizmodo. The resulting declines in performance following eastward travel appears to affect pitchers more than batters. The discovery that jet-lagged visiting teams perform better than jet-lagged home teams came as a surprise to the researchers. Allada isn’t entirely sure why this is the case, but speculates that visiting teams have a more structured daily schedule. “We speculate that teams may be more cognizant of their schedules when traveling away, thus mitigating jet lag effects,” he told Gizmodo. In terms of what can be done to combat jet lag, Allada recommends that teams travel ahead of time to a location to adjust to the new time zones. This is especially doable for starting pitchers, who typically pitch once every five days. The researchers suspect that these jet lag effects also apply to other leagues. Looking ahead, Allada would like to see if he can replicate his findings in other sports, such as the NBA and NHL. As for us regular folks, it’s not immediately clear how these findings might apply to our own travel experiences. But assuming we experience similar “declines in performance,” it’s probably a good idea to heed the experts’ advice. If possible, give yourself a few days to adjust to the new time zone before a major work-related activity or an important event in which you need to be sharp and alert. Why Are You Always Staying Up Past Your Bedtime?